From Chimay – Chimay beers are bottled away from the precincts of the Abbey of Scourmont, at the plant in Baileux. This ultra modern plant is known as “mixed” because it fills bottles of both 33cl (11.2 fl.oz.) and 75cl (25.4 fl.oz. ), not forgetting Magnums which occupy the whole plant on some days. The most impressive fact is its filling rate of 40,000 bottles (33cl (11.2 fl.oz.)) or 12,000 bottles (75cl (25.4 fl.oz.)) per hour! 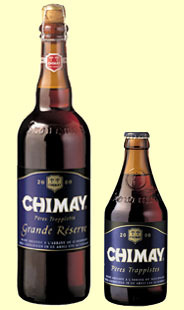 Chimay – Bleue – Grande Réserve – 750 ml. bottle poured into a Chimay Goblet. 9.0% abv. Purchased at Trader Joe’s, Monrovia, CA. Appearance: Pours a dark hazelnut brown with a dense foamy light tan head. Throughout the session, the dense head never goes away. Aroma: Light amount of sour funk and dry malts, bread crust and fruit cake. Taste: Raisin, prune, rustic crusty bread, cocoa powder, finishing with Belgian yeast and spicy, earthy hops. Mouthfeel: The dense head makes for a slightly creamy, moderately fizzy, medium bodied feel. Overall: Bold and balanced. Really tasty, and should be paired with food, or as a night capper.